Winona La Duke is a renowned Native American activist, environmentalist, economist and writer, and she’s also a part of the Anishinaaabeg (Ojibwe) community at White Earth in northwestern Minnesota. She and her community have worked together to conceive and begin the White Earth Land Recovery Project whose mission is “to facilitate the recovery of the original land base of the White Earth Indian Reservation, while preserving and restoring traditional practices of sound land stewardship, language fluency, community development, and strengthening (their) spiritual and cultural heritage.” The retail face of this project is Native Harvest, a business that offers naturally harvested foods and hand-made crafts. 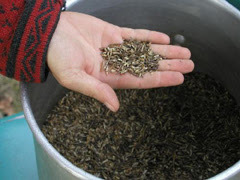 At Wedge Worldwide, we carry Native Harvest’s wild rice, maple syrup and maple butter. This enterprise was started in order to provide more income for those within the White Earth reservation community through Fair Trade labor and also as a way to share their traditionally made natural food with the general public. Native Harvest and Winona La Duke are the original Fair Traders in Minnesota. Native Harvest called their domestic, Minnesota-grown products Fair Trade, because they charged what they needed to charge to cover cost of goods and give their tribal members a decent return on their investment. They’ve boldly pioneered Fair Trade in this state, and I feel great about making their foods available on Wedge Worldwide. Even better, the White Earth Land Recovery Project and Native Harvest are involved in many wonderful environmentally and socially responsible initiatives that make me feel excited about supporting them through purchasing their yummy products. They are committed to caring for their land and using environmental practices such as renewable wind energy, working to save their and all wild rice from becoming cross pollinated with GMO wild rice strains, they are passionate about the bio-diversity of their Anishabee agriculture and work to create heirloom varieties of endangered species of corn, beans and squash and they also harvest maple sugar sap from their bio-diverse land in a sustainable manner that has been certified under the Forest Stewardship Councils. 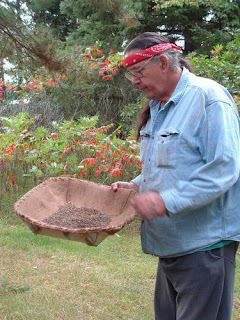 In addition, White Earth and Native Harvest have initiatives to provide healthful traditional foods to the Native Americans in their tribe that are living with diabetes, they teach Ojibwe language classes within their community, and offer a variety of cultural heritage learning programs to their young people. Wedge Worldwide is proud of the fact that Native Harvest is their first partner for the Wedge's domestic Fair Trade program. One way in which people are seeking to protect small and mid-size farmers from the creeping industrialization of sustainable agriculture is the introduction of Fair Trade into U.S. agriculture. Fair Trade is a trading partnership based on dialog, transparency and respect, that seeks greater equity in trade. It contributes to sustainable development by offering better trading conditions to, and securing the rights of, marginalized producers and workers.